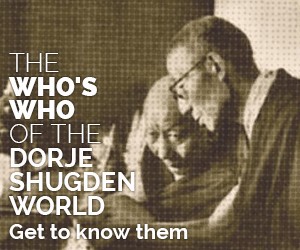 Like many organisations and entities set up with the sole objective of helping people in their lives, DorjeShugden.org freely provides this wealth of knowledge and information. Whilst it is common for educational entities and teachers to ask for support to keep their work going, our main reward comes from the positive feedback we have received of how our work has helped people with their daily problems, spiritual lives and even academic research. For this, we rejoice. However, the reality is that we too need your support to keep DorjeShugden.org going and improving so that even more people may benefit from the treasure of information within. If you have benefitted from our work, we seek your help so that we may extend this assistance to others around the world. Dorje Shugden is an enlightened being whose purpose is to help sentient beings in an often chaotic and complicated world. Many people have yet to experience the blessings of this Buddha. If you have benefited from his practice, why not tell others about it? Share us with your friends. They will thank you for this gem. Don’t be a stranger. Share your thoughts, questions and experiences and join our growing community of friends around the world regardless of your level of practice. DorjeShugden.org is managed by a team of very dedicated people, most of whom have happily given up on material pursuits in order to bring the joys of Buddha’s teachings to others. However, the reality is they still need your generosity to keep this site going. All contributions are welcome and help create positive energies for your own practice. The pure lineage of Dorje Shugden and Lama Tsongkhapa depends on the monastic sangha, who live only to uphold and preserve this precious lineage. Through them, the Buddha’s teachings have survived and flourished to this day. Making dana offerings to monks is regarded as a highly meritorious and effective practice to draw positive energies into our lives. Let us know how you can help us make this site even better. We welcome contributing writers, researchers, designers, illustrators, video editors and marketers to the spread the word.